The World Economic Forum is meeting in Davos this week, and as part of the agenda, the international organization released its annual Global Risks for 2014 survey to help identify potential pitfalls for the global economy in the year ahead. The survey of more than 700 representatives of the Forum’s global networks asks respondents to identify the five global risks that most concerned them among 31 pre-selected potential risks. Generally, economic and environmental woes topped the rankings. 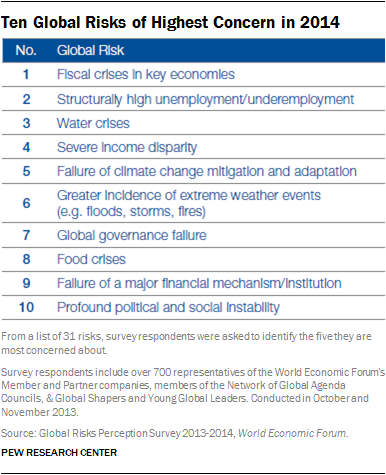 The number one identified risk is fiscal crises in key economies, including the Eurozone, Japan and the U.S. Next in line at number two is structurally high unemployment and underemployment, as “people in both advanced and emerging economies struggle to find jobs.” The third ranked risk is water crises, which along with climate change (#5), extreme weather (#6), and food crises (#8), makes environmental risks high on the minds of these global experts. Severe income disparity, or inequality, is the fourth highest risk. Rounding out the top ten are failures in global governance (#7), failures in major financial mechanisms (#9), and profound social instability (#10). In terms of broader public opinion, the top issues match up well with a Spring 2013 Pew Research Center survey, which found that climate change and financial crises were the top global threats identified by people we surveyed in 39 countries. Across these countries, a median of 54% cited global climate change as a major threat to their country, while 52% thought international financial instability was a threat. In terms of economic priorities, most publics surveyed prioritized unemployment and rising prices as an issue that government should address first. Overall, a median of 43% across the 39 countries surveyed flagged unemployment as the top priority, with nearly a quarter (24%) saying inflation should be the first issue addressed. However, only one-in-ten see the gap between the rich and the poor as a top priority for government. Public debt was only cited by 9% of people across the countries surveyed.